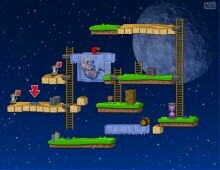 One of the best and most original brainteasers I have ever come across, Professor Fizzwizzle is an ingenious title from Grubby Games that plays like the "best-of" combination between the zany contraptions from The Incredible Machines series, and the devious puzzles from Deadly Rooms of Death. The Professor's robots have gone crazy. Your ultimate goal is to get to the control room on your lab island in order to reprogram them. Naturally, you have to navigate hundreds of puzzle-filled rooms scattered all over the island before getting to the final room. 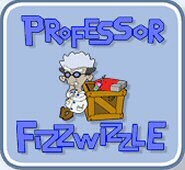 The best thing about Professor Fizzwizzle, like all great puzzle games, is the cleverness of the puzzles. Since you (the professor) cannot jump, you have to carefully plot each move, lest you accidentally trap yourself between crates or barrels, fall down, or otherwise shut yourself out from the exit transporter. Most puzzles require you to ingeniously move crates or roll barrels into the right position to create paths or press buttons to toggle gates, and use various gadgets such as magnets and ice guns at the right time. Timing is indeed important: for example, in many levels you need to roll barrels into a trampoline and stop them at the right time. Professor Fizzwizzle is a difficult game, but fortunately very user-friendly and forgiving with infinite retries and a gradual progression. Best of all, you can see the solution for each level if you really can't figure it out – every time I use this option, I can't help but feel amazed at the ingenuity of the designer :) Aside from the main ones, and the tutorial, there are also easy levels for kids, making the total of 230. If these are not enough, you can design your own with the included level editor.